Asahi Pentax K1000 II, 35mm SLR. Photograph gallery. 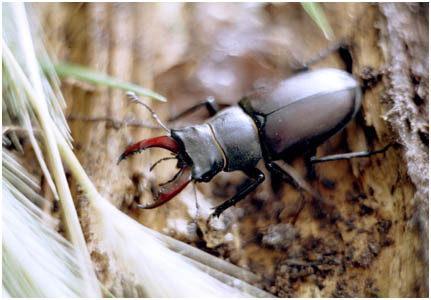 Britain's largest beetle, the Stag Beetle. In flight they sound like clockwork toys. This chap was photographed in July 2007, using a couple of extension tubes to get close in. Herculaneum is a ruined Roman Town, destroyed in the eruption of Mount Vesuvius, in 79AD - the same eruption destroyed Pompeii. Pompeii is fantastic in all respects, but in many ways Herculaneum is better. The buildings are well preserved, in some cases the remains of the 1st floors may still be seen. Remarkably some of the wooden fittings survive in charcoalised form. This panoramic photograph, taken in March 2000, is a bit of a cheat, as it is in fact two pictures joined together, the two pictures are joined down the middle of the pillar in the centre of the picture, fortunately the resolution of web base pictures disguises the join rather convincingly. Pompeii is famous for its wall paintings, and Herculaneum has a fair share also. March 1999, the Great Wall of China. This section of the wall is roughly 25 miles outside of Beijing. The day we visited it decided to snow. At first this was a bit disappointing, but as we climbed up into the low cloud it became more interesting with every step. the cloud killed all the sounds of other activity and rendered the place silent, and few people wanted to venture high into the clouds. Occasionally the towers were manned by conscripts. The restored sections of the wall have the added benefit of modern metal hand rails, a pleasantry denied the original occupants. 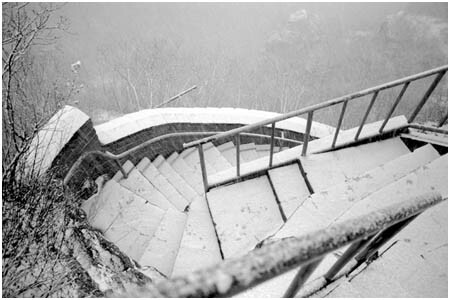 Coming down as the fresh snow laid on the steps was "interesting". 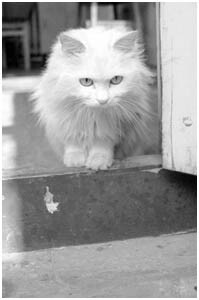 The little white cat was spotted in the Houtong district of Beijing, exhibiting the single minded curiosity of any other cat.